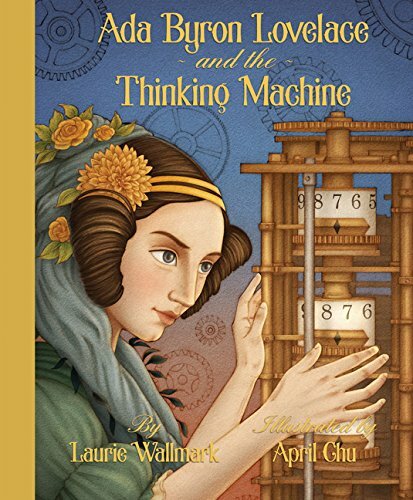 ADA BYRON LOVELACE AND THE THINKING MACHINE by Laurie Wallmark is a perfect topic for Women’s History Month. Before the invention of the computer she was a mathematician who created an algorithm, a set of mathematical instructions. This picture book biography was specifically created for STEM. I would have liked to see a glossary as part of the back matter. It would have been very useful. The teacher’s guide says it is for grades 1-4, with the caveat that the teacher has to consider what would work for the specific grade. For grades 1 and 2, the teacher could lead a discussion about what a thinking machine is. The students could draw thinking machines. This book has a number of math problems, which are best for the older grades. The teacher’s guide would work very well for grades 5-8. This age range would not want to read a picture book but they could research and write their own papers on Ada. Or the teacher could just select sections from the book for class use. Nonfiction picture book authors run the risk of being told a topic is too advanced. Perhaps more advanced texts will be a growing trend.